This loveable llama pendant adds a touch of whimsy to your look. Every once in awhile, even a pack animal likes to be carried. Give the lovable llama some rest and wake up your style with this charming necklace. 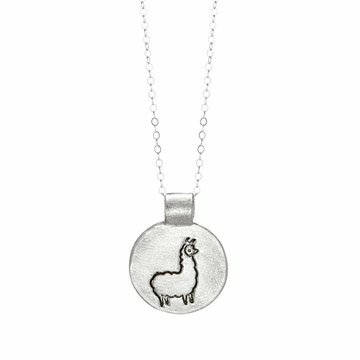 Drawn by Susie Ghahremani, the alpaca's cute cousin has been pressed into a reclaimed silver pendant by Christine Street. Handmade in California. Make it a set! Click here to see the matching Lucy The Llama Stud Earrings. Earrings may be cleaned using a mixture of warm water (1 cup), baking soda (1 tbl) and salt (1 tbl). Wipe with cloth after soaking for 20 minutes. Silver polish or tarnish removers are acceptable. When not being worn, store in a closed container of some sort, ie... plastic bag, jewelry box, non-wool cloth. Avoid wearing in chlorine.